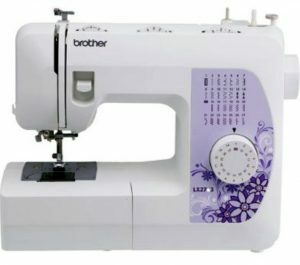 Brother XM2701 Review - Why this Sewing Machine Model is for You! The XM2701 by Brother is a fun, robust sewing machine that offers everything from a lightweight design to 27 stitches that will allow you to confidently sew any garment or project with ease. Complete with six sewing feet and an instructional DVD, the XM2701 is the ideal choice for beginners and experts alike. When reviewing the Brother XM2701 sewing machine, we were able to work through numerous projects to give it a test run. There were some things we absolutely loved about the XM2701, while a few things we would have changed if we designed it ourselves. Before diving into our Brother XM2701 review, let’s take a look at which features were really strong, and which ones we would have changed. For a sewing machine in this price range (under $100), these quirks are easily overlooked. The dim LED light can be remedied by placing the unit in a bright room. But there is nothing you can do about the presser foot lever – you’ll have to reach up under the arm to get it. I’m not sure why it was designed this way instead of the lever being placed in the back like numerous other sewing machines. With that said, this inconvenience is easily overlooked by its stronger features. And if you’re a beginner or this item is a gift for someone else that is new to sewing, you’ll find that all of these little extras mean projects can be started quickly instead of having to go out and buy other supplies to begin the project. The threading system is a major perk of the Brother XM2701 sewing machine. Simple and easy, all you need to do is touch a lever (located on the side of the machine), and the machine will push the thread right through the needle. Anyone with bad eyesight or that has minor dexterity problems – or anyone that hates threading needles – will find that this is the most effortless way to thread a needle. When trying to wind your bobbin, you‘ll place your upper thread in the appropriate position, set the bobbin on the winder, push the control to the right – and you’re good to go. The machine will automatically wind the bobbin on your behalf. So, the complete setup process for a project is simple. I almost forgot to mention that this is a drop-in top bobbin that is jam resistant. It really couldn’t be any easier to get your bobbin and thread in place. Select Stitch: It’s important to select the stitch before beginning. There are 27 total stitches offered, and all you have to do is turn the dial to the right stitch number. Above the stitch dial is a chart of all the stitches and their corresponding numbers. Put on the Light: Dim as it may be, I prefer working with the LED light on. If you’re going to be sewing for a few hours at a time, I recommended switching on a brighter light as you’ll find the light isn’t adequate. Change Feet: There are six feet options offered, and the feet snap on and off for easy replacement at any time. When choosing the stitches, you’ll also find that the stitch selection includes stitches for decorative sewing, too. At this low price it even comes with a 1-step auto-size buttonhole maker that works extremely well, so you can make the perfect buttonhole time and time again – no guesswork required. We completed a myriad of sewing projects with this machine, but we didn’t try thicker jean material. We’re not positive how this model would perform on thick, difficult materials, but we were able to work through stretchy material (often a difficult task) with virtual ease. While this model doesn’t claim to be a heavy duty sewing machine, some users have said that they worked through denim without an issue, so that’s a good sign. The Brother XM2701 exceeded our expectations, and this is the right sewing machine for easy transport – for those times when you don’t want to carry around an ultra-heavy model. If you’re new to sewing or really want to be thorough with your choice, you’ll find that the instructional DVD is priceless. The DVD works you through the entire machine’s setup process, which makes it effortless to get started. Even a person that works with sewing machines often will find tidbits of information in the video that makes life just a little easier. And in terms of maintenance, this model is maintenance-free from a user standpoint. There is no way to oil the machine. This is a common trait with Brother sewing machines. Servicing the unit as recommended by Brother will ensure that it’s up to any sewing project you throw at it, and will extend the lifespan of the unit. As an inexpensive, robust sewing machine, the Brother XM2701 is as good as it gets. If you are looking for something with a few more features, then you might want to consider the Brother CS6000i. Hi Jenny, I don’t know much about what that might be. I would bring it in to have someone take a look at it. 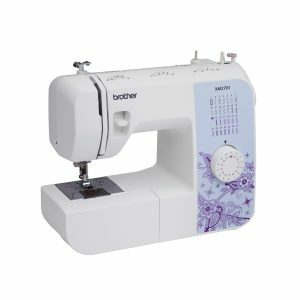 I received this machine as a mother’s day gift and am new to sewing-can you recommend a starter kit for supplies that would work with this machine (threads/etc)? This one is a very popular kit that is inexpensive and has all of what you would need to get started.